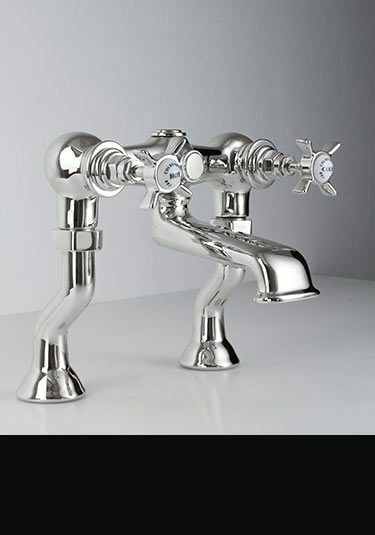 Welcome to our beautiful collection of Livinghouse bath taps and bath fillers. Selected for their good styling and high quality build from exclusive Italian and German manufactures our bath fillers offer superb European quality, reliability and long life. Within our collections we have deck mounted, bath rim mounted and wall mounted taps designs as well as freestanding bath taps for fancy floor mounting which are available for both highly contemporary and traditional Victorian style bathrooms. Nowadays there are many types of bath tap available and in many different styles. 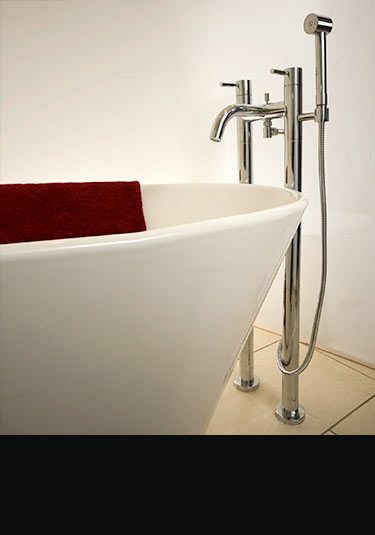 We have pillar bath taps with are the traditional hot and cold taps that fits onto a standard baths. 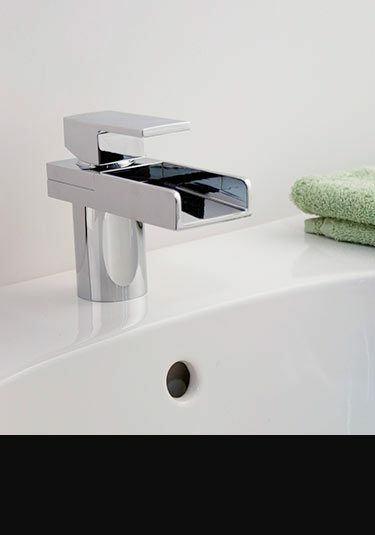 There is also monobloc bath filler designs, which use a single mixing cartridge and are better known as single lever taps or just "bath mixer taps" they use just 1 handle to mix the hot and cold water. We also have 3 piece bath taps, which includes the hot tap, a cold tap and a water spout. They can be deck mounted or mounted onto the rim of the bath or contemporary wall mounted by building into the wall above the bath. For added luxury there are 5 piece bath tap sets which can be wall or deck mounted and includes the hot and cold taps, bath filler spout, diverter and handheld shower head attachment which can also be wall mounted or as a pull-out from the bath rim. If you want an impressive design feature within the bathroom area we also offer freestanding bath taps and floor mounted bath filler spouts which are operated via a separate mixer control. 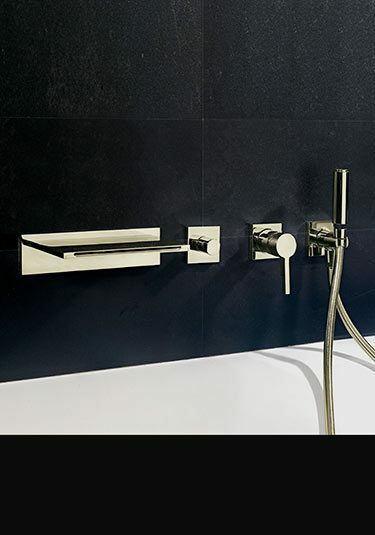 These feature taps are ideal for luxury interiors and we have versions for minimalist and contemporary bathrooms as well as traditional designs for Victorian and Art Deco styled bathrooms. So as you can see the choice of designs is huge, and just to confuse even more in your selection we have many tap finishes as well. There is the electro plated finishes of chrome, black chrome, gold, nickel and copper plus the polished and brushed finishes for brass and stainless steel. 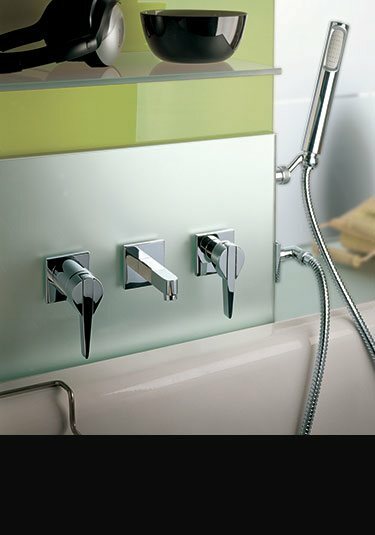 We also have bath sensor taps which have illuminated glass fronts with automatic infrared activation sensors to operate. And if you want a coloured bathroom theme, we also have white and black powder coated finishes as well. So the conclusion is, there are a many styles and design theme choices. With some clear thinking and a little imagination you can produce your dream bathroom to your own exclusive design. And please remember our bath brassware are part of full matching ranges which include fittings & accessories for basins and bidets, with matching shower heads and shower valves to compliment so the whole design theme can be carried through the bathroom and shower area. 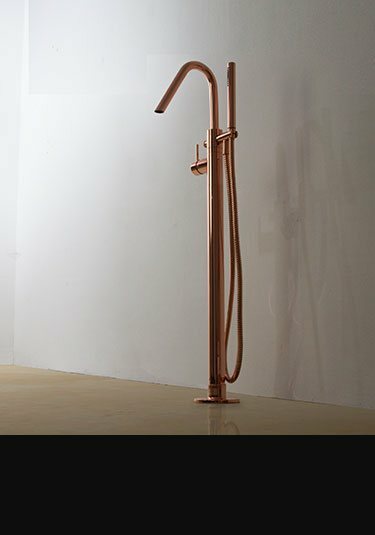 A designer Italian bath filler with a built in shower attachment. 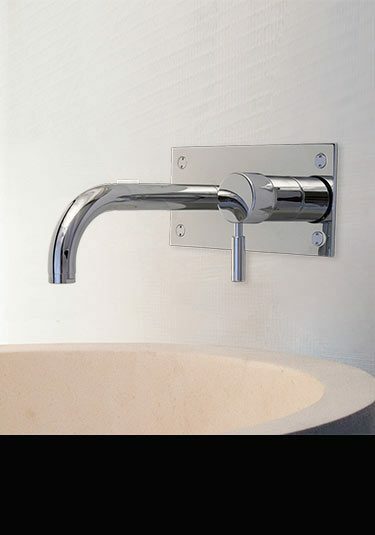 This wall mounted tap has contemporary chrome backplate styling which is increasingly popular in top end bathroom design. 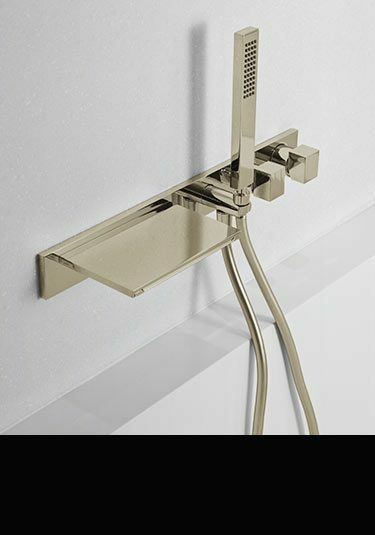 Each bath shower tap has a single lever control valve, which can be switched via the built in divertor to the bath spout or the shower head. 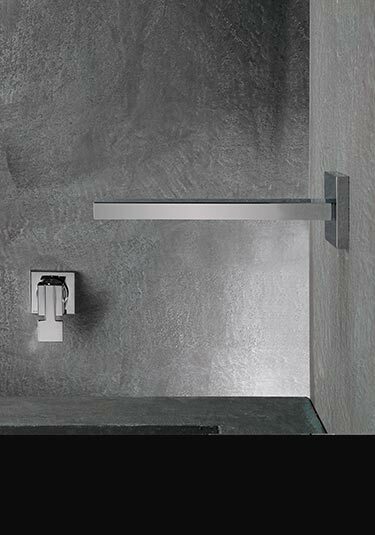 A wall mounted designer bath filler in contemporary Italian styling. 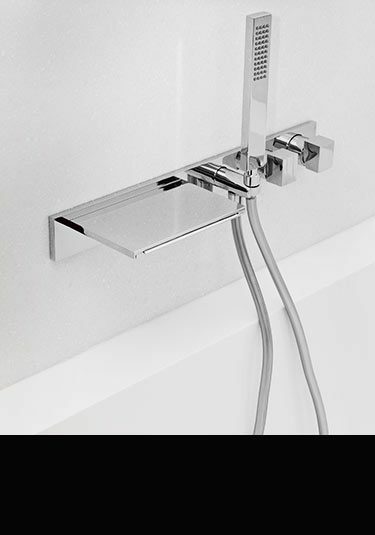 Each bath tap includes a handheld shower head that is wall fixed and controlled via a single lever mixer which easily diverts between the handy shower attachment and tap. This stainless steel bath tap with handheld shower is supplied with wall or deck mounted water spouts. 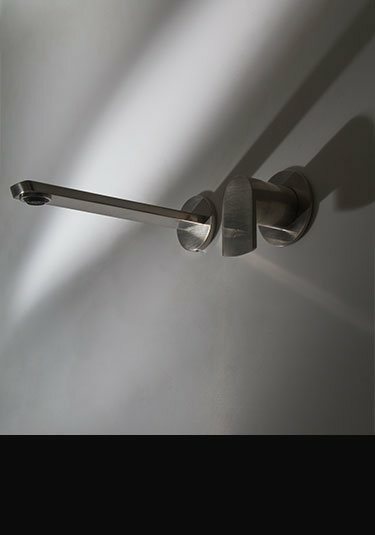 The latest in European bathroom design, this bath shower filler has a satin brushed finish and 8 colour handle choices. 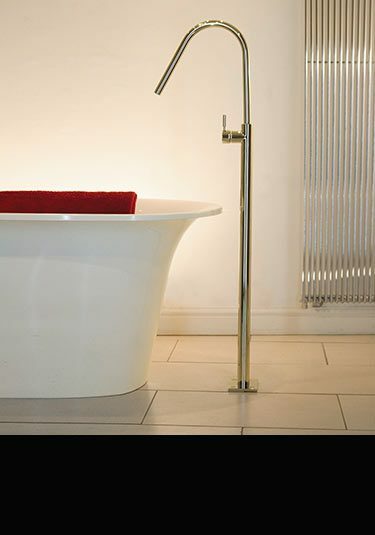 This bath filler with a cradled shower attachment has lovely contemporary styling based on an older bathroom design. 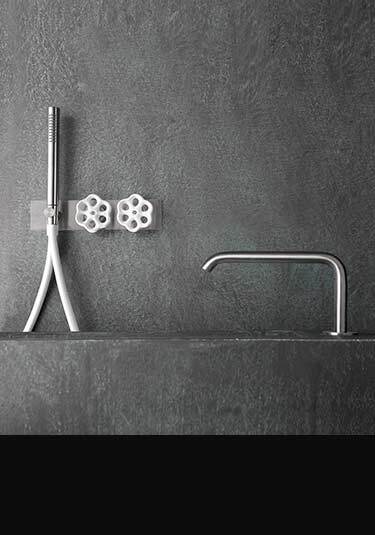 Eash bath tap has beautifully sculptured crosshead taps and a luxury quality shower attachment. We can supply this bath tap for wall mounting aswell as deck mounting if preferred. Minimalist stainless steel bath tap with handheld shower attachment in a satin brushed finish. This exclusive bath filler is ideal for luxury bathroom design. 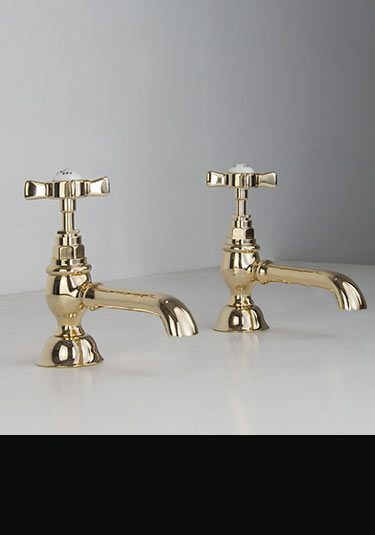 Beautiful gold bath taps in a traditional Victorian design. Made in Italy ensuring lovely European quality. 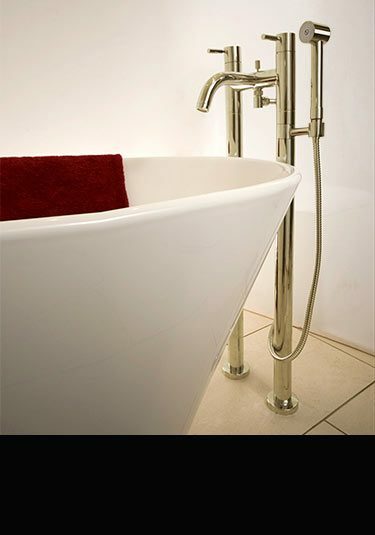 Beautiful quality wall mounted gold bath taps in an old Victorian style. 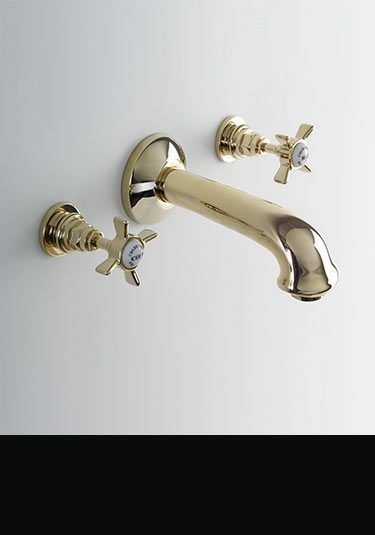 These traditional taps are part of a full collection luxury bathroom taps, that are manufactured in Europe. Impressive Italian manufactured gold bath filler tap available for wall mounting or mounting on the bath rim. This traditional bath tap is beautiful quality and styled on an old Victorian design. Italian designed and manufacture gold bath filler with shower head attachment. 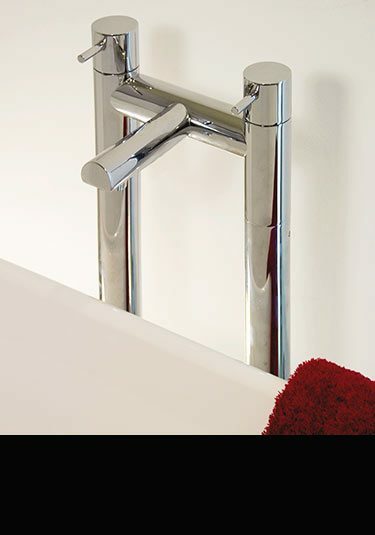 This bath shower tap is ideal addition to any traditional bathroom design and is superb quality. 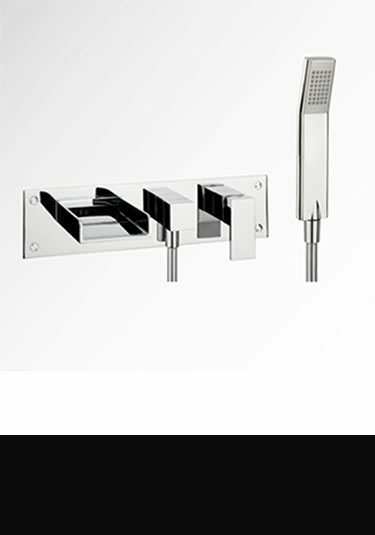 A contemporary wall mounted 2 piece bath filler using a stylish cubic wall spout with a single lever mixer control in an exclusive black chrome finish. 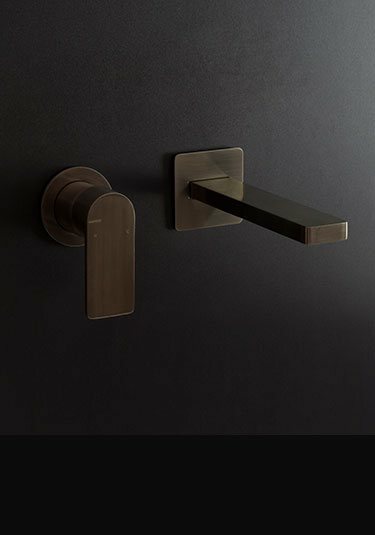 This unique finish is available in a polished or satin brushed finish and makes a beautiful design feature within high quality bathroom styling. This black chrome 4 piece bath filler is available in a polished and satin brushed texture. 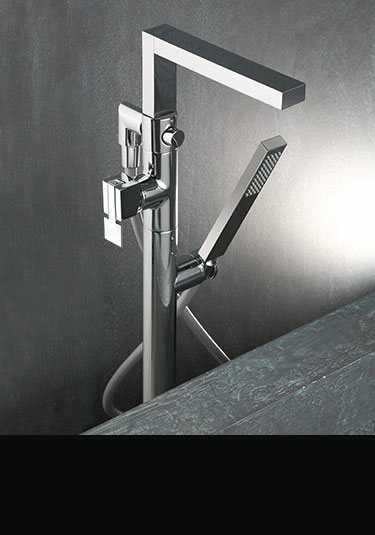 With its single lever control coupled with wall mounted spout, diverter valve and handheld shower with a wall outlet holder, this bath tap bring a little bit of luxury to the bathing area. 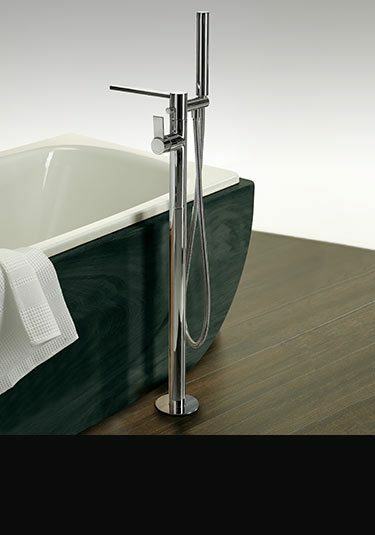 A contemporary styled bath tap with a cubic shower attachment is Italian designed. 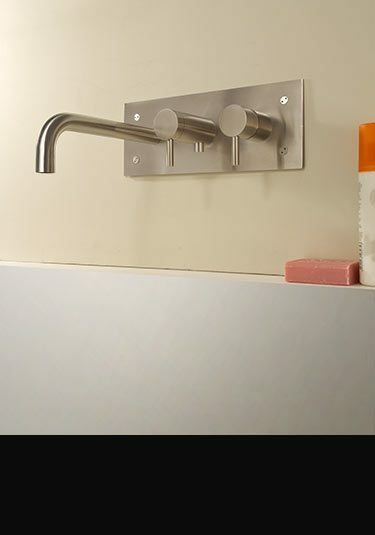 This wall bath filler has a single lever control for the quick and easy mixing of the water which diverts to the handheld shower when required. This contemporary wall mounted bath filler has a handheld shower attachment allowing easy hair washing and bath cleaning maintenance. 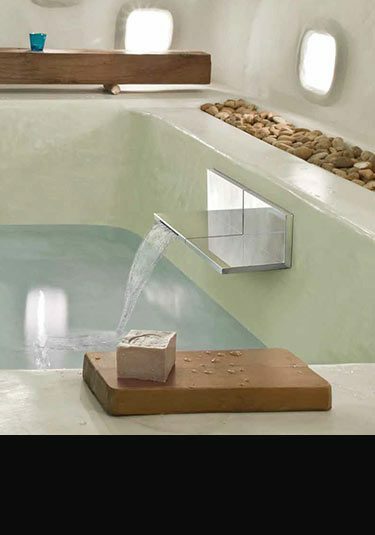 This bath filler is Italian designed and manufactured ensuring great design and long lasting service. This highly contemporary basin tap consists of a wall spout with a remotely situated basin mixer valve. 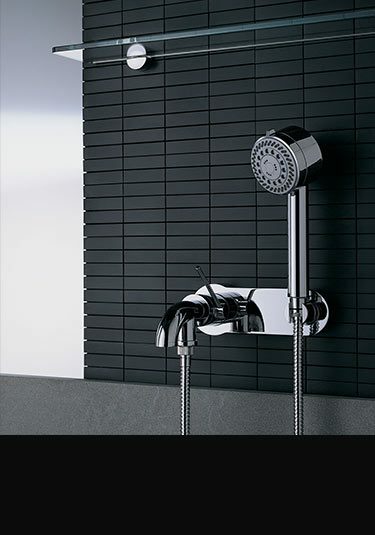 Styled in Italy this designer cubic tap is available in chrome as well as matt black and white finishes. 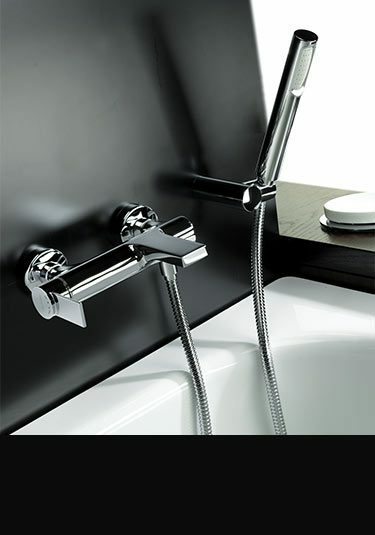 With its cubic styling, this square deck mounted spout is available of both basins & as a bath filler tap. 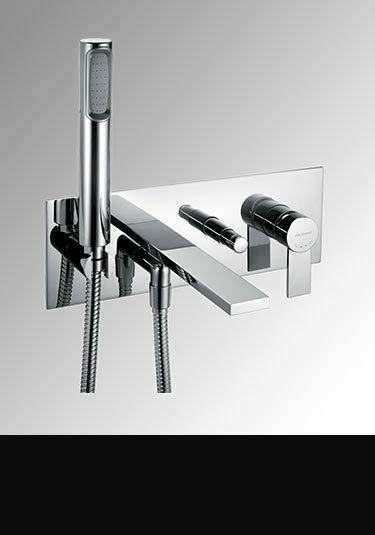 We also offer wall mounted and deck mounted tap control choices & various finishes including chrome, matt black & white. 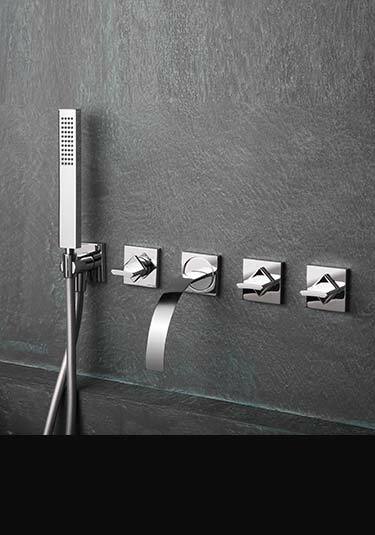 A designer bath tap with a handy shower attachment designed for contemporary wall mounting. This bath filler is styled on square and cubic lines and is available in chrome, as well as black and matt white painted finishes. Italian designed and made in the EEC. 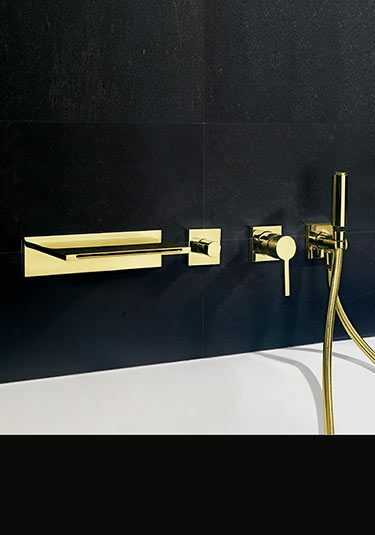 A high quality chrome on brass construction, this floor standing bath filling spout is a designer touch to high quality bathrooms. Designed to be operated remotely via a mixer tap, this bath spout has an option of spout end designs. Designed to be flush mounted to the wall this wall bath tap with a shower attachment outlet is made of brushed stainless. Each tap has a mixer control for the bath filler spout and a mixer control for a shower head and hose. (not shown or included) Exclusive high quality design and manufactured in Europe. This deck mounted bath mixer is thermostatically controlled to ensure the water temperature is delivered at the temperture set and is not altered by the water volume. 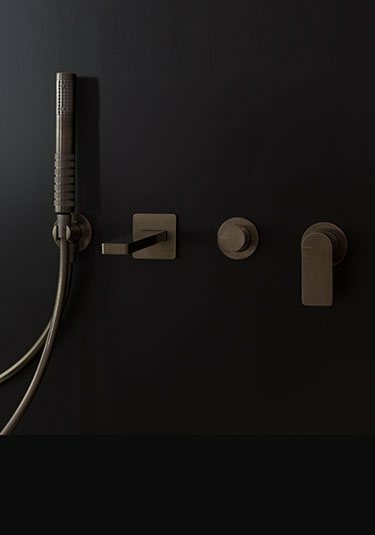 Each thermostatic tap is European manufactured ensuring the high quality and is a luxury feature to any bathroom design. 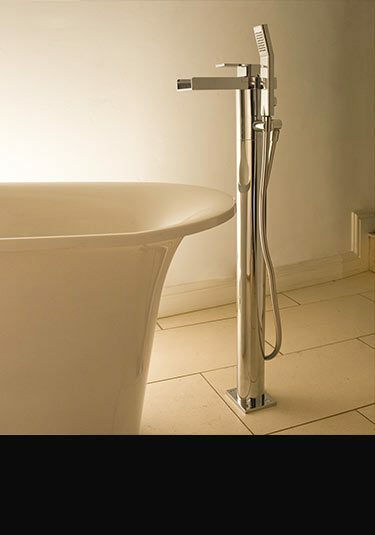 A chrome bath wall tap with a luxury thermostatic cartridge. 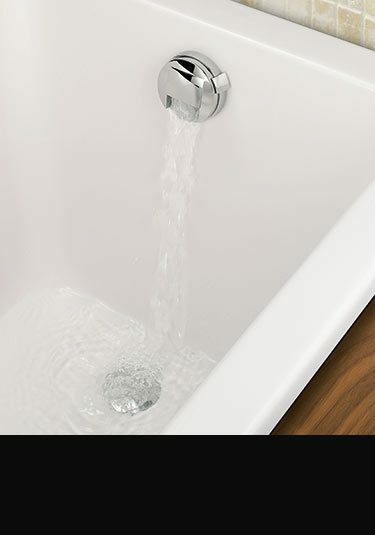 This unique bath filler is designed to be recessed into the wall and supply via its thermostat hot water at the temperature required whatever the water volume is. This thermostically controlled feature adds luxury quality to top end bathroom design. A lovely quality pair of pillar taps in an authentic traditional design. These 3/4 inch bath taps are made in solid brass with a smooth plated finish and is a lovely design alternative to chrome. 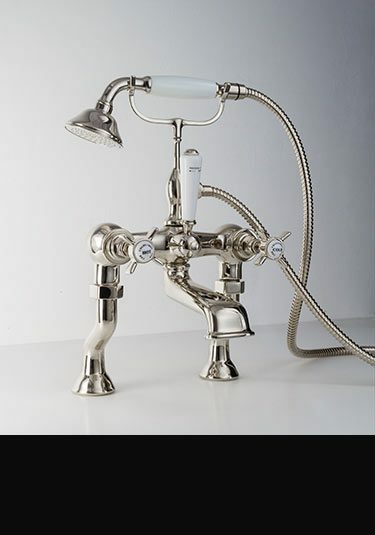 A classic traditional 3 piece bath tap design for wall mounting and in a Victorian style. 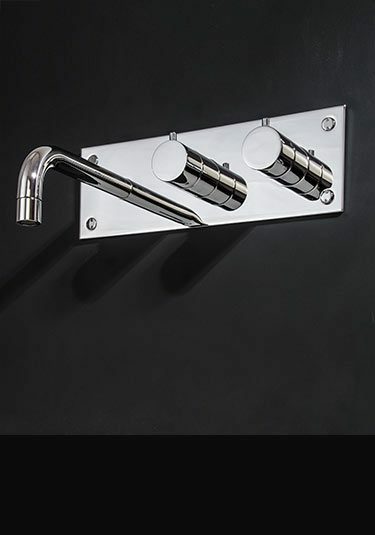 This traditional wall mounted bath filler is luxury Italian manufactured ensuring great quality. 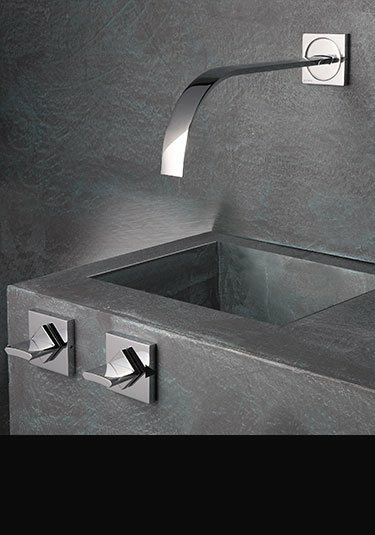 Impressive Italian manufactured nickel bath filler designed for wall mounting or bath rim mounted. 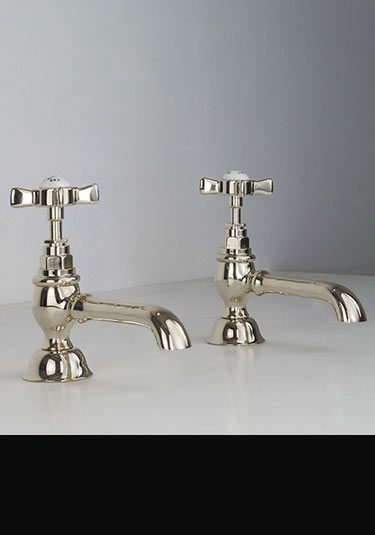 These traditional bath taps are made of superior brass with a thick plated finish. Lovely quality and ideal design alternative to chrome. 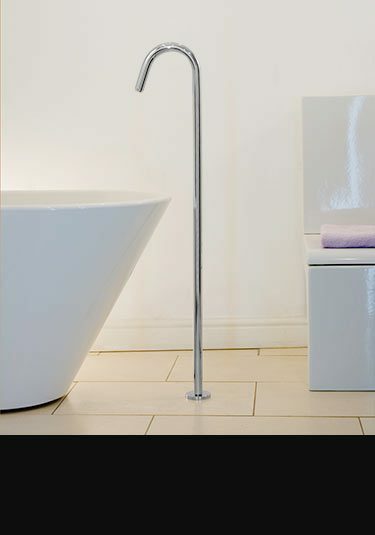 Italian designed and manufacture nickel bath filler with a handheld shower head attachment. 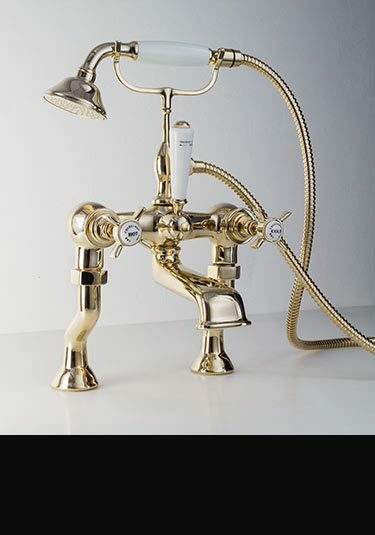 This traditional bath tap is made in solid brass with a thick plated finish & Victorian styled. . 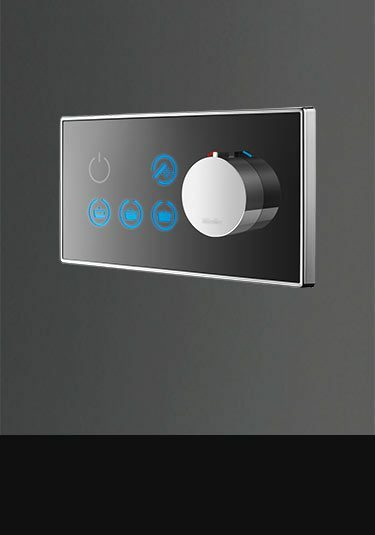 This electronic bath tap with shower mixing function is controlled the via illuminated icons on the black of white glass control plate. 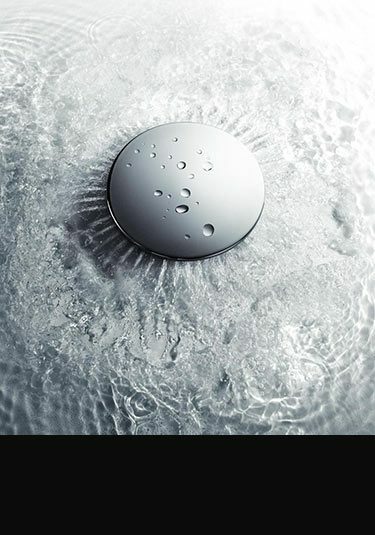 The digital tap is touch controlled and has a programmable bath filling function white automatically stops at the agree depth. 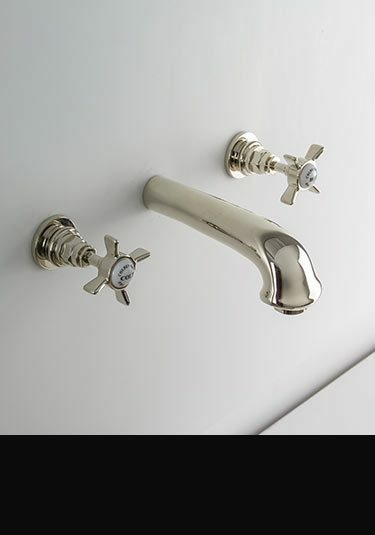 Designer wall mounted taps that are designed and manufacture in Italy. 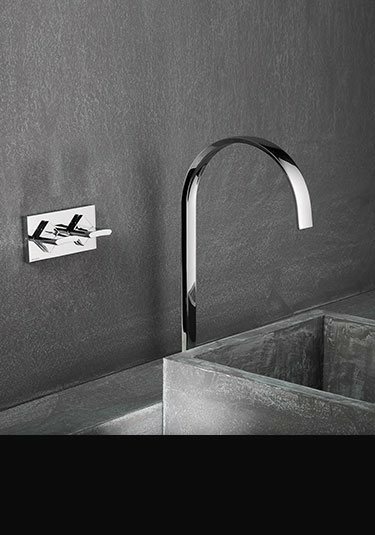 Each Italian tap consists of a stylish flat water spout and a separate hot and cold. 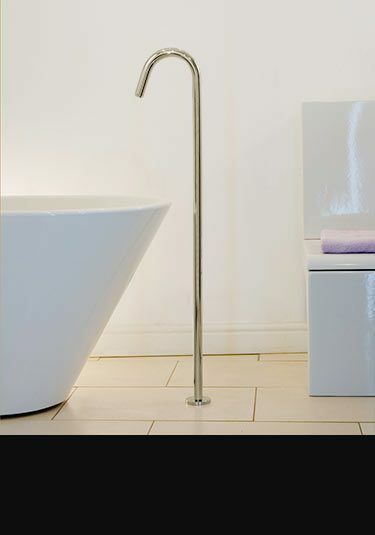 Available as a wash basin tap or as a bath filler this collction is a beautiful design choice in top end bathrooms. 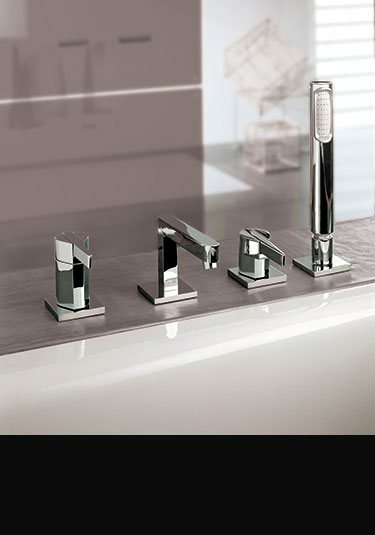 Luxury bathroom taps designed for using with both wash basins and baths and manufactured in Italy in a chrome on brass finish. This deck mounted tap consists of a flat water spout with a separate hot and cold allowing fast water filling. 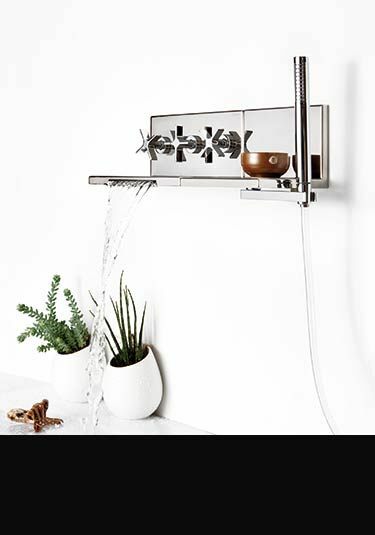 This stylish deck mounted water spout with a hot and cold mixer tap is available for both wash basins and as a bath filler. 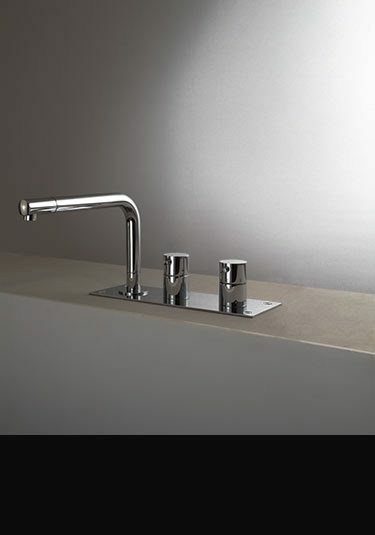 A designer Italian tap with a lovely flat spout makes an exclusive choice in luxury bathrooms. This Italian luxury 5 piece bath tap set is a designer addition to any high end bathroom design. 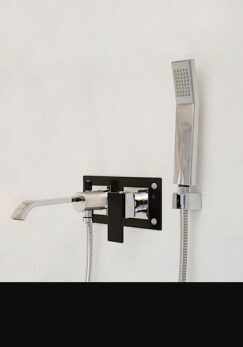 Comprising of a flat wall spout, a separated hot and cold tap for fast bath filling and divertor which switches the water to a handheld shower attachment. 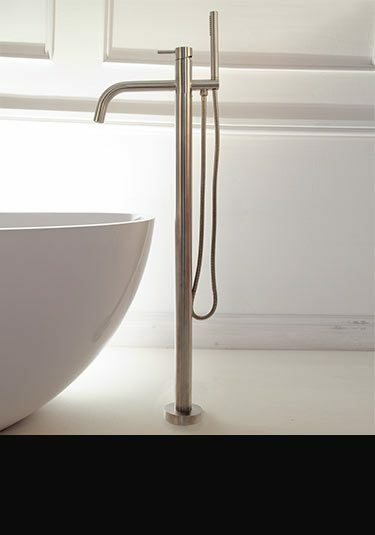 A luxury contemporary bath tap that is designed to be flush mounted onto the wall. 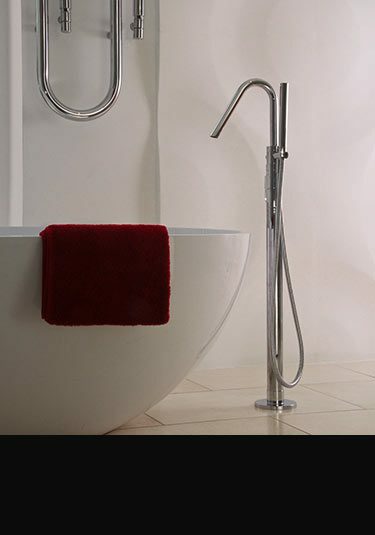 Each bath filler has a stylish built in mixing valve allowing for easy water mixing. European designed and made. A lovely quality bath tap designed to be deck mounted onto the bath rim. Each filler has a separate hot and cold tap which improves the speed of the bath filling. High quality European manufactured 15 years guarantee. A deck mounted tap designed to be installed onto the bath rim. This tap has a built in shower attachment allowing easy hairwashing and bath cleaning. This filler has separated hot and cold taps which allows faster bath filling. A bath filler built into the overflow is a nice minimalist design touch. This overflow tap is operated remotely using a separate mixer valve. 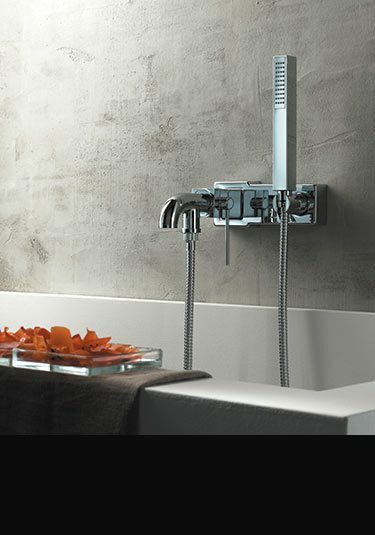 A lovely design touch in contemporary bathrooms which is designed and made in Italy. 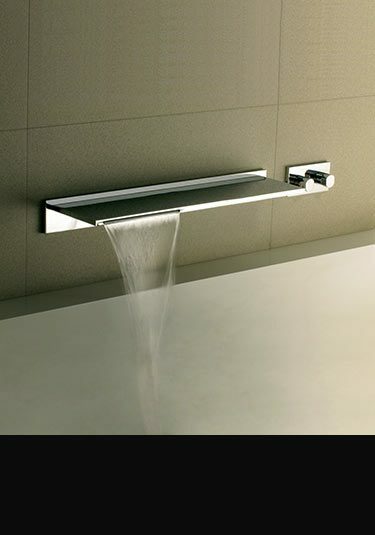 Lovely quality waterfall bath spout is a stylish and tranquil way of filling you bath. 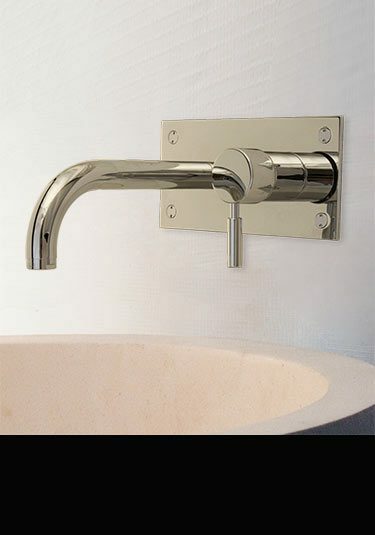 Available in chrome or brushed nickel which is very similar to brushed stainless steel. We also offer a matching side shelves to compliment. 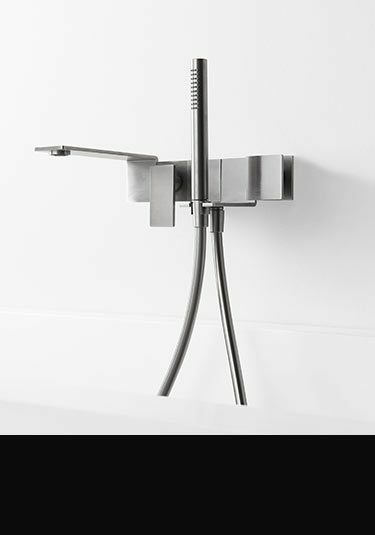 This Italian designer bath tap has a waterfall spout and built in diverter for switching between the bath filler and a shower head. 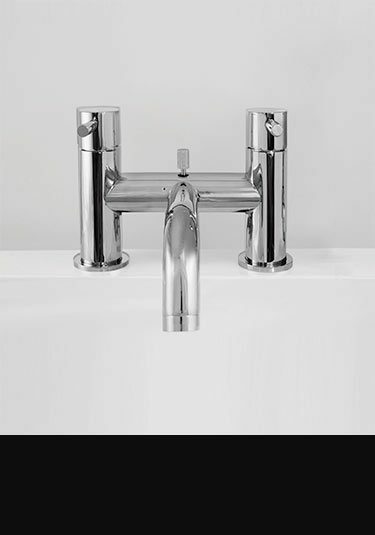 Available in a chrome or brushed nickel, this unique crosshead design is lovely European quality and made for luxury bathroom design. This luxury waterfall bath tap has a matching shelf with shower head attachment which is diverted to via the bath filler. Available in chrome or brushed nickel which is very similar to brushed stainless steel, this waterfall taps collection is an ideal design feature within top bathroom styling. 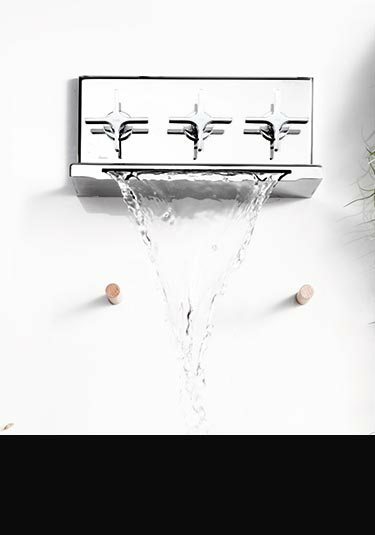 A contemporary wall mounted 4 piece waterfall tap with lovely Italian styling. Each waterfall bath tap includes a 200mm waterfall spout as well as a separate handheld shower. Beautiful quality & luxury styling. Contemporary waterfall bath filler with a shower attachment which is all fitted onto a single backplate. 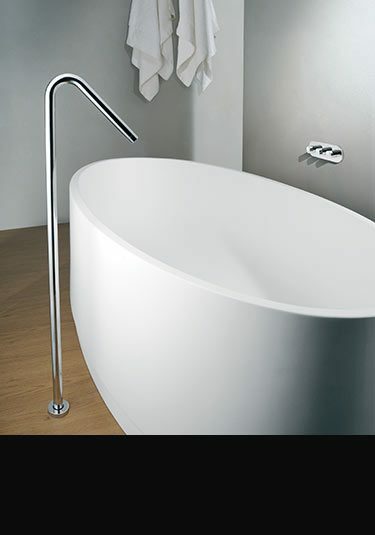 A luxury nickel bath filler, this exclusive design is manufactured in Italy ensuring top quality & beautiful styling. A luxury waterfall bath filler spout with remote tap controls. 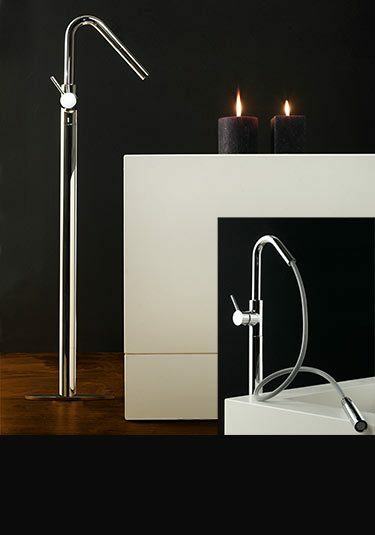 This luxury bath tap is Italian styled & high quality European manufactured. This large nickel bath tap is beautifully finished in the latest waterfall styling and makes a luxury design feature to any exclusive bathroom design. This cascading bath filler is lovely European quality and Italian styled. 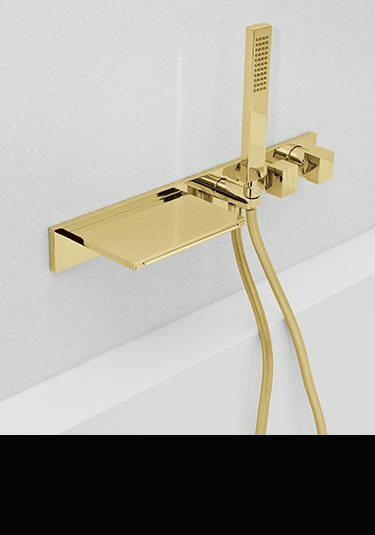 A polished gold bath filler with a handheld shower attachment can be supplied for wall fixing or deck mounted for bath rim installation. 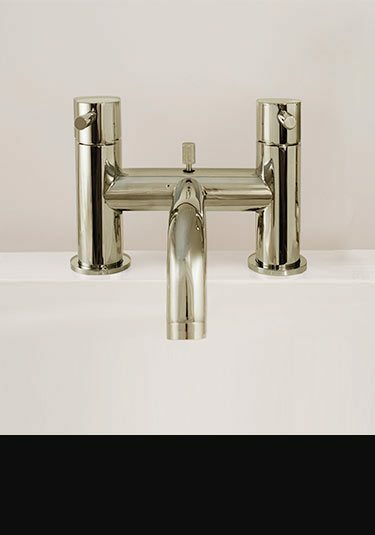 This classical styled bath tap is top quality European manufactured and is also available in a warm nickel plated finish. Lovely quality and styling. 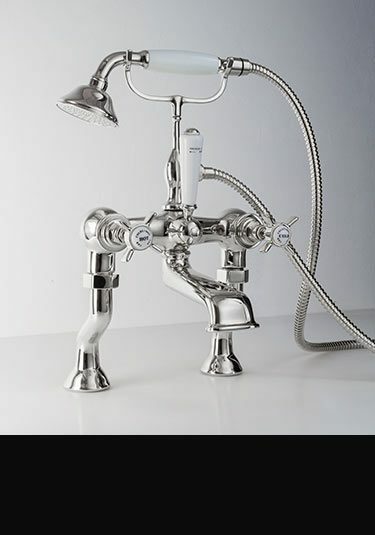 A classic traditional styled 3 piece bath filler tap design for wall mounting. 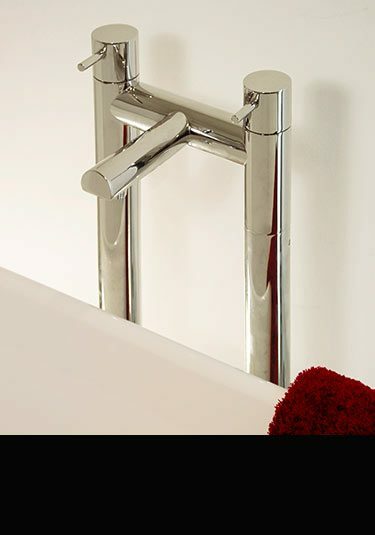 This chrome bath tap is luxury manufactured in Italy ensuring great quality and is Victorian in design. 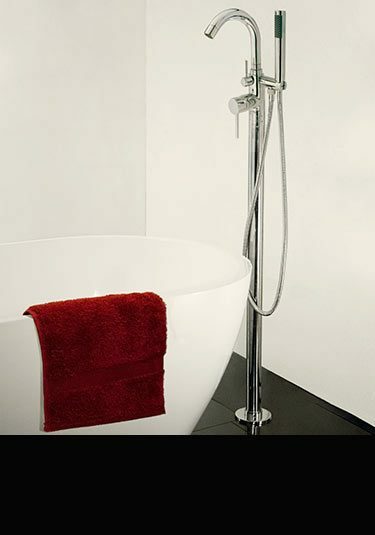 Lovely Italian manufactured bath filler supplied for wall mounting or bath rim mounting. This gold bath tap is made of solid brass with a thick chrome plated finish. Beautiful quality and ideal for traditional themed bathrooms. 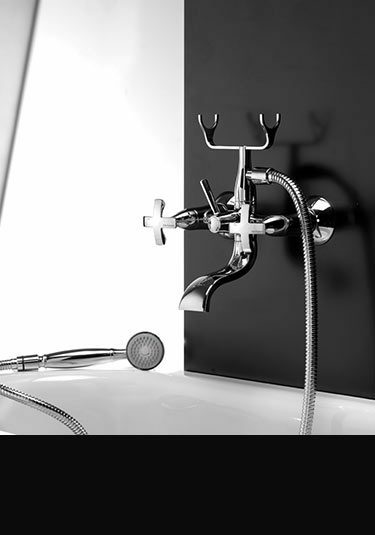 An Italian designed and manufacture bath tap with a handheld shower head attachment. 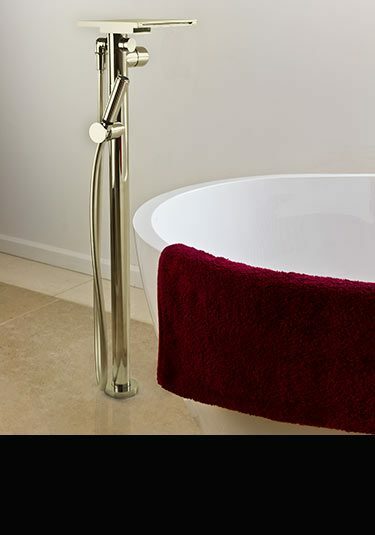 This traditional bath filler is made in solid brass with a thick chrome plating. 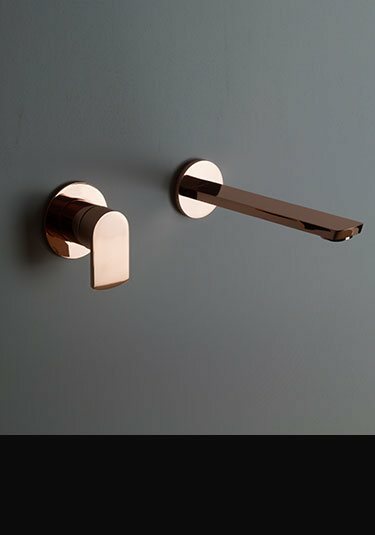 A wall mounted bath filler with unique bathroom styling. 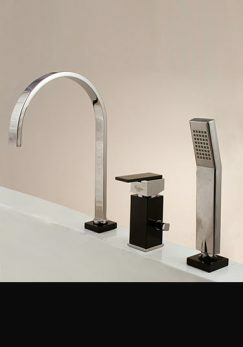 Italian made with a separate hot and cold taps, ensures rapid bath filling. 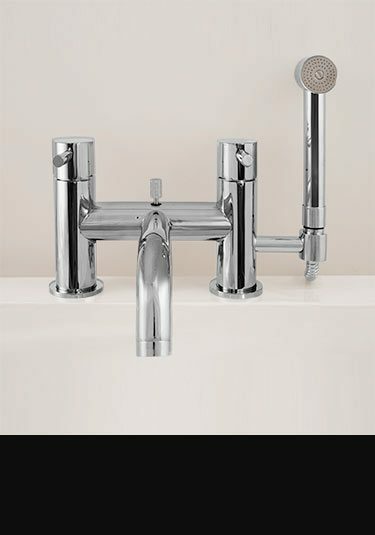 Unique Italian styled 4 piece bath tap set including single mixer tap, bath filler spout, diverter and pull out shower spout. Lovely contemporary styling. 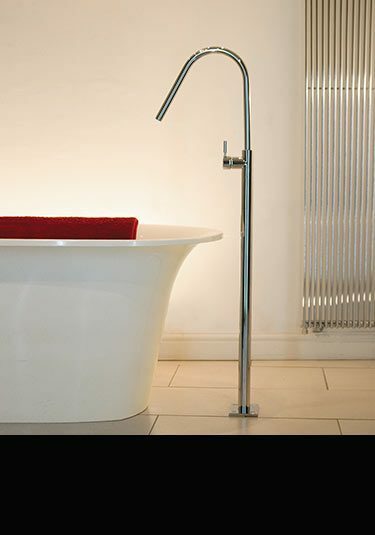 This large waterfall bath tap is a beautiful luxury addition to any exclusive bathroom design. Made in solid brass this gold plated tap makes an impressive design feature. 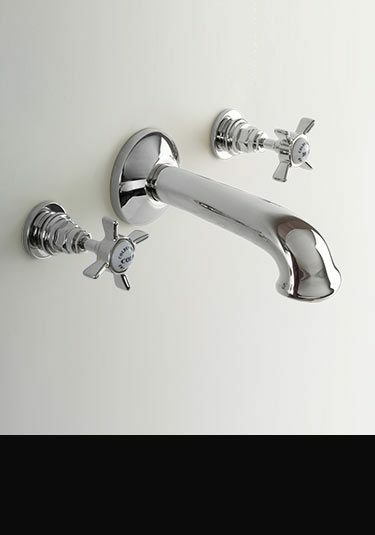 Part of a full range of waterfall taps. 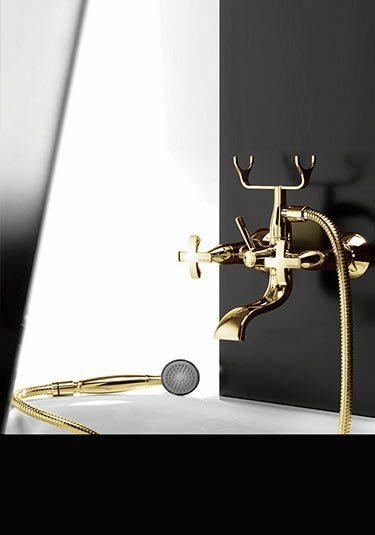 Luxury quality gold bathroom taps with an impressive waterfall spout. This 4 piece waterfall tap is made of solid brass with a thick gold plating and makes a lovely design theme in high quality bathroom styling. 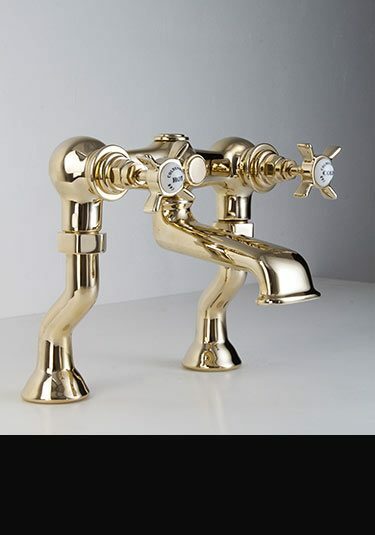 Impressive gold plated 4 piece tap set with an impressive 200mm waterfall spout. 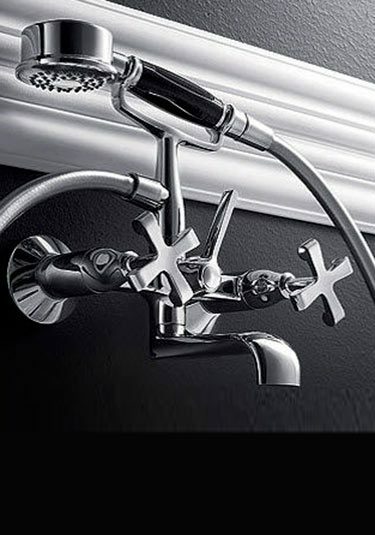 This luxury tap is beautiful design and luxury European quality. 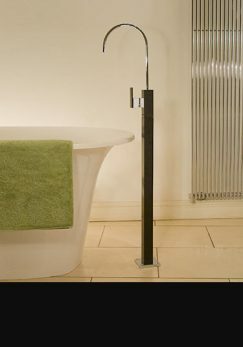 A black and chrome bath filler which is wall mounted and supplied with a handheld shower head. Designed and manufactured in Europe. 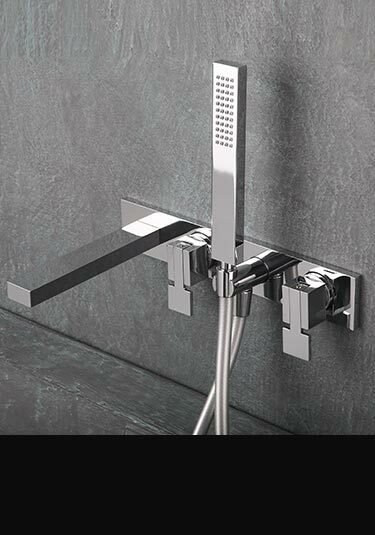 A deck mounted or rim mounted bath tap has a separate designer bath filler pout and a pull out shower head all operated via the single lever mixer tap. Designed and made in Europe ensuring quality and longevity. A monobloc bath filler with a single lever water control. 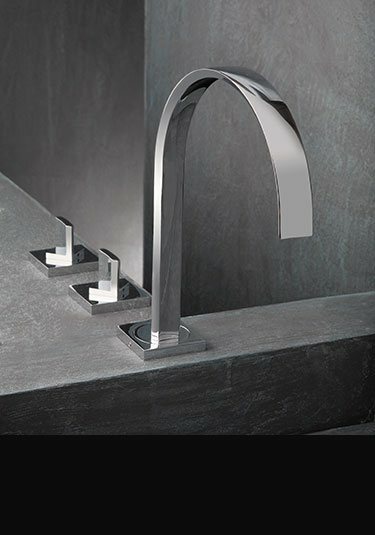 This designer tap has a large open spout with a cascading waterfall flow. 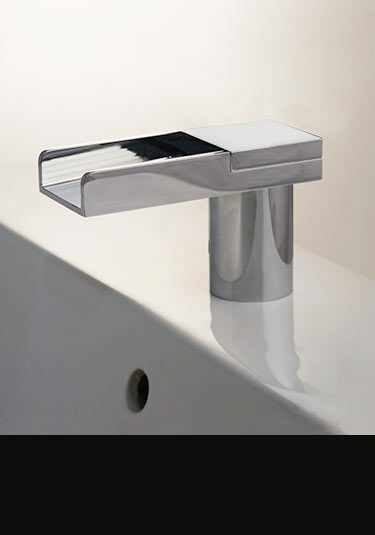 Designed and manufactured in Italy this tap is the luxury quality that exclusive bathrooms require. A deck mounted rim spout for bath filling. This open spout produces a large waterfall water flow with a genteel ease. 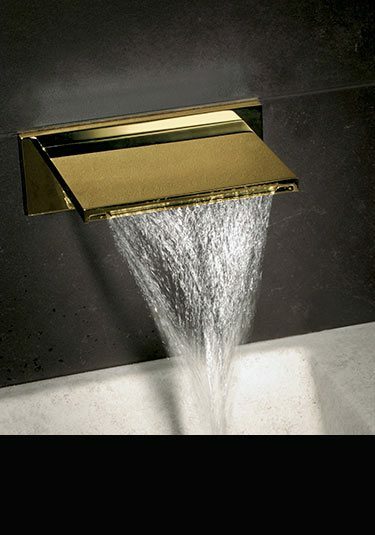 Operated remotely via a separate tap valve this waterfall spout is an ideal theme to designer bathrooms. This open spout bath filler tap has a genteel waterfall action to the water flow. 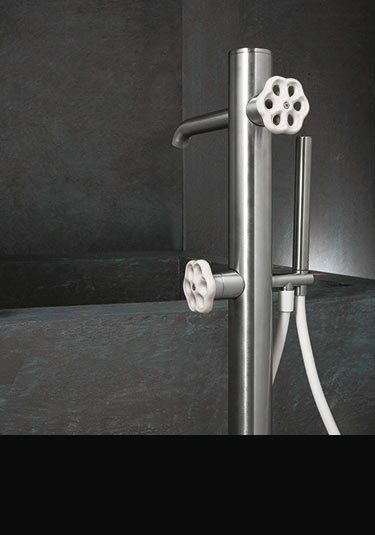 Each bath tap has a pull out handheld shower with a divertor valve to switch between the two. 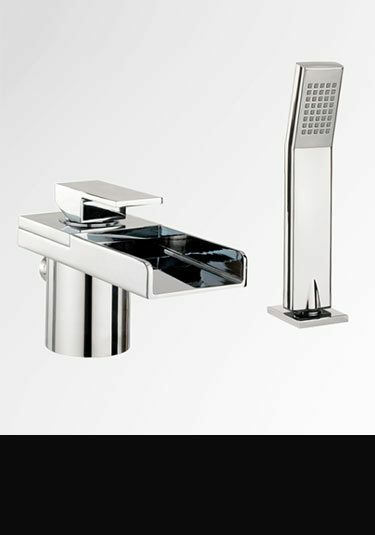 A lovely designer freestanding tap has a large open waterfall spout for the water to cascade from. 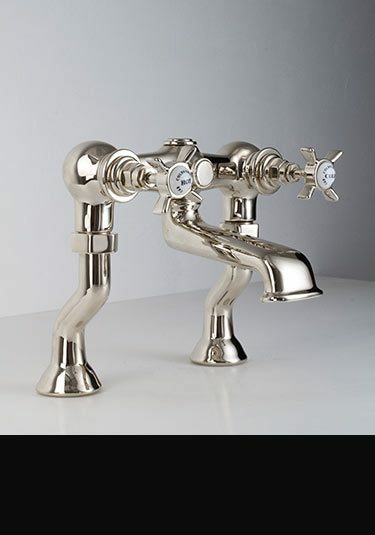 This Italian tap is made of heavy brass and chrome and is, the very high quality that luxury bathrooms require. A bath filler with an open waterfall spout and separate handheld shower attachment. Both functions are easily operated via a single lever mixer that is switched using a divertor valve. 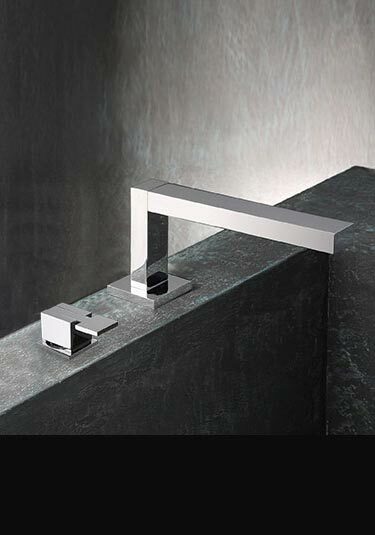 Designed and manufactured in Italy this waterfall tap is lovely design theme in high quality designer bathrooms.